A man had been chain-smoking for thirty years. When he became sick, the doctor said: “You will never be healthy if you don’t stop smoking.” But he was a chronic smoker and he could not help it. He had tried to stop, and he had tried hard and he had suffered much in trying, but he withstand only one or two days, and then again the urge to enjoy the smoking come so tremendously, that he could not resist. He fell again into the same pattern. Because of this smoking he had lost all self-confidence: he knows he cannot do a small thing; he cannot stop smoking. He had become worthless in his own eyes; he thought himself just the most worthless person in the world. He had no respect for himself. He came to me; he said, "What can I do? How can I stop smoking?" I said, "Nobody can stop smoking. You have to understand. Smoking is not only a question of your decision now. It has entered into your world of habits, it has taken roots. Thirty years is a long time. It has taken roots in your body, in your chemistry, it has spread all over. It is not just a question of your head deciding; your head cannot do anything. The head is impotent; it can start things, but it cannot stop so easily. 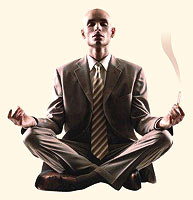 Once you have started and once you have practiced so long, you are a great yogi – thirty years’ practicing smoking. It has become autonomous; you will have to de-automatize it." He said, "What do you mean by ’de-automatization’?" And that’s what meditation is all about: de-automatization. I said, "You do one thing: forget about stopping. There is no need either. For thirty years you have smoked and lived; of course it was a suffering, but you have become accustomed to that too. And what does it matter if you die a few hours earlier than you would have died without smoking? What are you going to do here? What have you done? So what is the point – whether you die Monday or Tuesday or Sunday, this year, that year – what does it matter?" He said, "Yes, that is true, it doesn’t matter." Then I said, "Forget about it; we are not going to stop it at all. Rather, we are going to understand it. So next time, you make it a meditation." He said, "Meditation out of smoking?" I said, "Yes. If Zen people can make meditation out of drinking tea, and can make it a ceremony, why not? Smoking can be as beautiful a meditation." He looked thrilled. He said, "What are you saying?" He became alive! He said, "Meditation? Just tell me – I cannot wait!" I gave him the meditation. I said, "Do one thing. When you take the packet out of your pocket, for a moment go slowly. When you are taking the packet of cigarettes out of your pocket move slowly. Enjoy it, there is no hurry. Be conscious, alert, aware; take it out slowly, with full awareness. Then take the cigarette out of the packet with full awareness, slowly – not in the old hurried way, unconscious way, mechanical way. Then start tapping the cigarette on your packet – but very alertly. Listen to the sound, just as Zen people do when the samovar starts singing and the tea starts boiling, and the aroma. Then smell the cigarette and the beauty of it..."
He said, "What are you saying? The beauty?" "Yes, it is beautiful. Tobacco is as divine as anything. Even Morarji Desai is divine, so why not tobacco? Smell it; it is God’s smell." He looked a little surprised. He said, "What, are you joking?" "No, I am not joking." Even when I joke, I don’t joke. I am very serious. "Then put it in your mouth, with full awareness, light it with full awareness. Enjoy every act, small act, and divide it into as many small acts as possible, so you can become more and more aware. "Then have the first puff: God in the form of smoke. Hindus say, ’annam brahm’ – ’ Food is God.’ Why not smoke? All is God. Fill your lungs deeply – this is a pranayam. I am giving you the new yoga for the new age! Then release the smoke, relax, another puff... and go very slowly. "If you can do it, you will be surprised, soon you will see the whole stupidity of it. Not because others have said that it is stupid, not because others have said that it is bad: you will see it. And the seeing will not be just intellectual. It will be from your total being, it will be a vision of your totality. And then, one day, if it drops, it drops; if it continues, it continues. You need not worry about it." After three months he came, and he said, "But it dropped." "Now", I said, "try it on other things too." This is the secret, the secret: de-automatize. Walking, walk slowly, watchfully. Looking, look watchfully, and you will see trees are greener than they have ever been and roses are rosier than they have ever been. Listen. Somebody is talking, gossiping: listen, listen attentively. When you are talking, talk attentively. Let your whole waking activity become de-automatized.